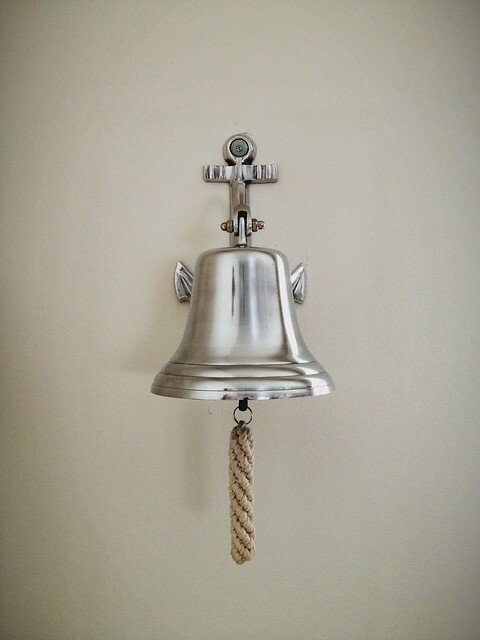 Three and a half years ago I passed on a fantastic ship's type bell at Home Goods in Pennsylvania and I immediately regretted it. It was going to replace a little musical triangle as our dinner bell, because Sir O was constantly losing the metal stick portion of it. Somewhere in our move back to the West the triangle was lost and so was a really fun family tradition. So when I found another awesome bell at TJMaxx lately, I knew I better buckle down and buy it or I'd be haunted by regret all over again.